In the old days, lost highways carried me through paradise and pandemonium alike, and all the while I played master in the guise of the servant. It was a good life, albeit a reckless one. I left many a foolish dreamer strung out in the Sewers of Estark cursing fate in hopes of finding one more puff from the Bottle of Suleiman, and many more selling their moxen in the Bazaar of Baghdad in the hopes of securing enough loot to escape back to the safety of the past. But once you find yourself in the woods of my saga, there is no turning back. Even if you choose not to enter the Adventurers Guildhouse, you cannot shake off the dust from the road that carried you there. No longer pursuing Plaything Masters, in the modern era I travel with whatever unscrupulous assembly of heathens I can find. For Eternal Weekend this year, the bastards found me. It started with Mike and Alex wanting to rekindle some of the degeneracy of GP New Jersey. Upon hearing that I planned on staying home, they set to work. In the middle of the day, while the cat slept in the stale sunlight, they broke in and stole my bottle. It was all they needed to commit me. They were so proud of themselves for using it to blackmail me into going that they forgot about the wishes they were entitled to (perhaps for their own good, as I have a long history of poorly interpreting the words of mortals.) It was a simple plan, properly executed, and I offered no resistance. I recruited my Brother Andrew, seemingly innocent, to help me recover the bottle at the end of the adventure, and the party was set. On Saturday, I played in Legacy Champs, piloting my beloved Charbelcher deck to a 3-3 record before dropping to find food and substances to occupy the rest of the day. It was much of what you would expect from Legacy right now. I faced Miracles, Omnitell, Omnitell, Enchantress, Omnitell, and Reanimator. The food and the beer that were the aftermath were much better than the magic, but my first five opponents were excellent and many of them owned some beautiful cards. On Sunday, I piloted a fairly stock Forgemaster Shops to certain Doom. I again dropped at 3-3, once again to find food and intoxicants. I lost round one to Jaco, playing a build of 2 Card Monte that preoccupied my mind for the rest of the day. I did not remotely mind losing to him as I considered his deck as my next endeavor. 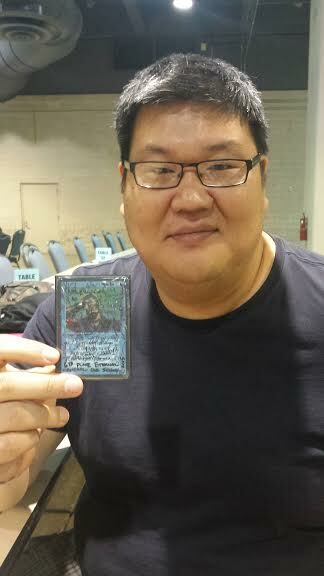 I beat Oath when he cast Show and Tell and played Griselbrand on turn 2, and again when he oathed him up on turn 3. This was the high point of my day, at least in relation to magic. I then beat a Mentor deck, lost to a Grixis deck tuned to prey on me, crushed an opponent who did not get to play cards, and lost the mirror. It was enough for me, and I was satisfied overall, especially an hour later when I was drifting about like Pendrell Mists with a belly full of Thai Food. On the surface, it was a fairly typical Eternal Weekend. Mike chose Word of Command. He cast it more than once. And every time he did, it was a beautiful experience. But that is his story. 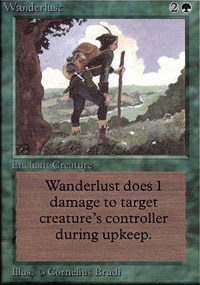 When asked why this card was his favorite oldschool card, Mike explained how the card perfectly embodied the art. On the surface, it seemed rather simple and awkwardly arranged. But when you look closer, there is something truly menacing in every facet. Countering a spell stops it from taking form. But taking a spell and using it against its owner gives form to true power. A lazy wizard reacts. A driven wizard strikes pre-emptively. There was more, but it was mostly drowned out by his maniacal laughter. Mike broke into tales of all the awful things he had done to unsuspecting mages, but most of them are not safe to print here, out of concern for incriminating my friend and driver. 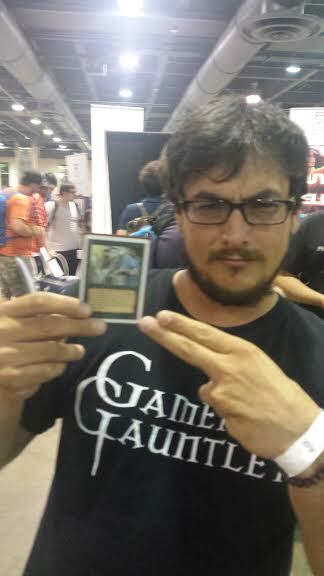 Danny Friedman is the only person I have met that is as passionate about Oldschool Magic as I am. He chose Gauntlet of Might because he just picked up a Beta one, the indirect result of making top 8 of the Saturday Vintage event. I asked him about it, but I don’t remember exactly what he said. What I do remember is that he loved that card more than most people love their children. And rightly so, it is older than those children and has lived a far more interesting life. It may not grow up to cure cancer, but it is old enough to drink two bottles of rum and give make Goblin King look lazy by doing his job and adding a mana flare to boast. I met Kevin at Eternal Weekend, and I am grateful that I did. 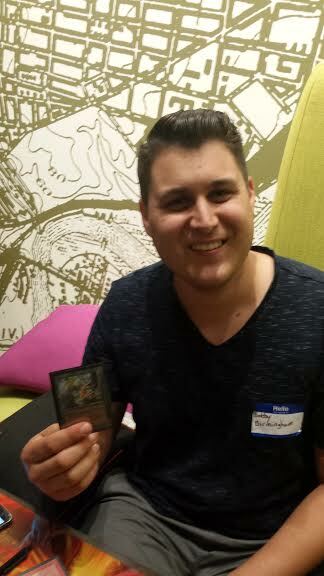 Aside from being a great guy who is enthusiastic about playing the format, Kevin made top 8 of the Eternal Central Event (winning the pictured Psionic Blast signed by all participants) with Barbary Apes in his deck. Why? Because Kevin fears nothing. So what if Elvish Archers have first strike? Have you seen the art on these Apes? They are not afraid of anything either. When asked why Psionic Blast was his favorite Oldschool card, Kevin tried to explain that it was not and in fact he was torn between Erhnam Djinn and something else, but I just talked over him and asked him again. He eventually was compliant, or was tricked into showing me his prize, but either way Kevin has such a strong love of Psionic Blast that I felt compelled to tell you about Barbary Apes. At this point in the interview process, I realized that it was probably good that I did not pursue a career in media. Jeremy is the kind of fiend that can be talked into anything. 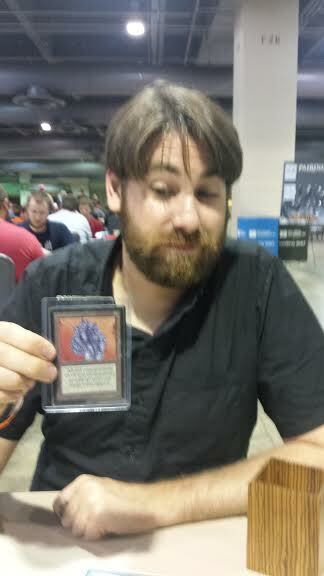 When an assortment of others decided better of it, he willingly held up the Lich and let me take his picture. Afterwards I explained how I was going to write about how Lich was his favorite Oldschool card, and he was bewildered and insulted. Then he asked what it did. Two hours later, he was trying to figure out every possible way to gain Life with Lich in play, and every way to live while at zero life so that the graveyard clause of Lich could resolve. Eventually his brain melted, and it took the remainder of the weekend for his inner demons to reconstruct it. My Brother changed his mind numerous times. Everything from Lord of Atlantis (even with a minimal selection of Merfolk) to Icy Manipulator, he eventually settled on Avoid Fate. He blew me out with it one time and now its his favorite card. Sounds about right. 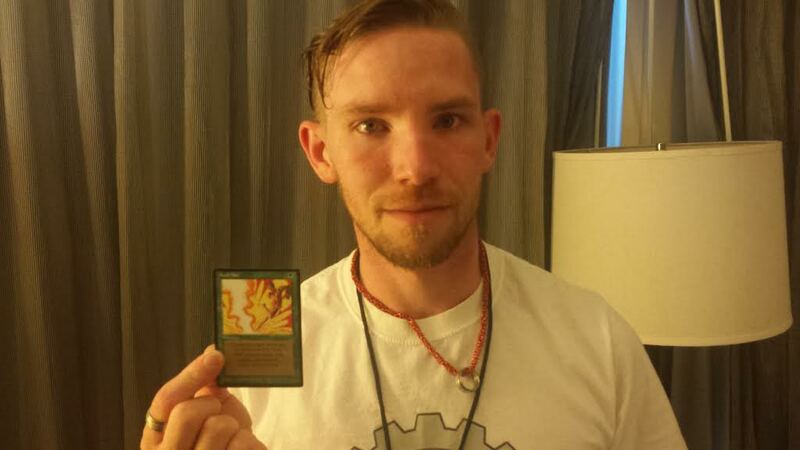 Bobby is another player I was fortunate enough to meet in person at Eternal Weekend, and at the moment when I talked to him he was excited about the power of Erhnam Djinn. 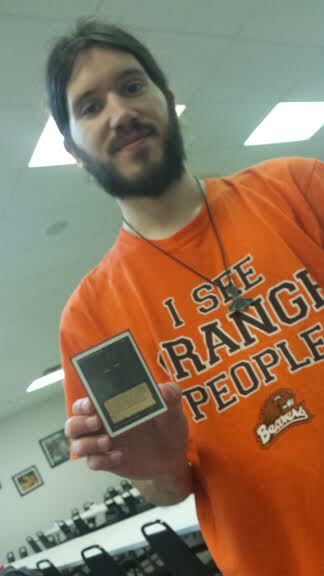 It won him more than a few games on the day and he wished he would have included a fourth copy in his main deck. 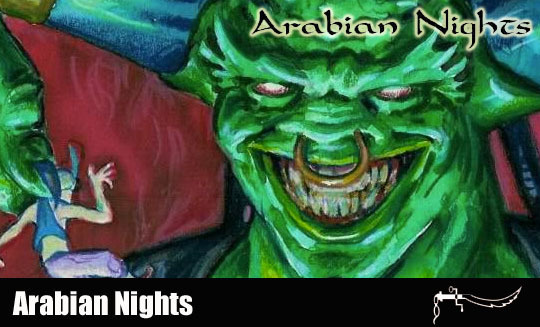 This is no surprise to me, Erhnam Djinn has been wreaking havoc around me since we first met in 1994. I suspect he will continue to do so for many years to come. It was exciting to see Bobby playing Oldschool and having so much fun with it after watching him take interest in it over Twitter. If you have not tried the format out, there are many of us who would happily tell you what you are missing. On a different day I may give a different answer, but one thing will remain constant. 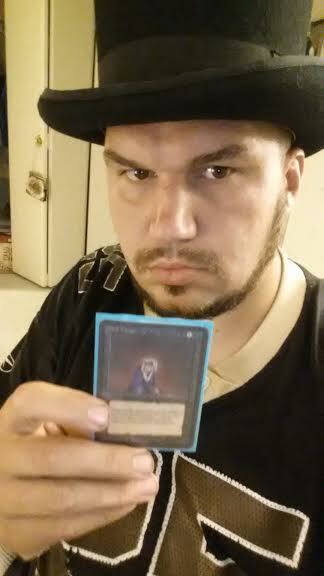 My Favorite Oldschool card will be a black card. If it is a creature, it will be Demonic Hordes or Sengir Vampire or Juzam Djinn and occasionally Eater of the Dead. If it is a spell, it could be The Abyss, Nether Void, Pestilence, but really, one card stands out above all others. 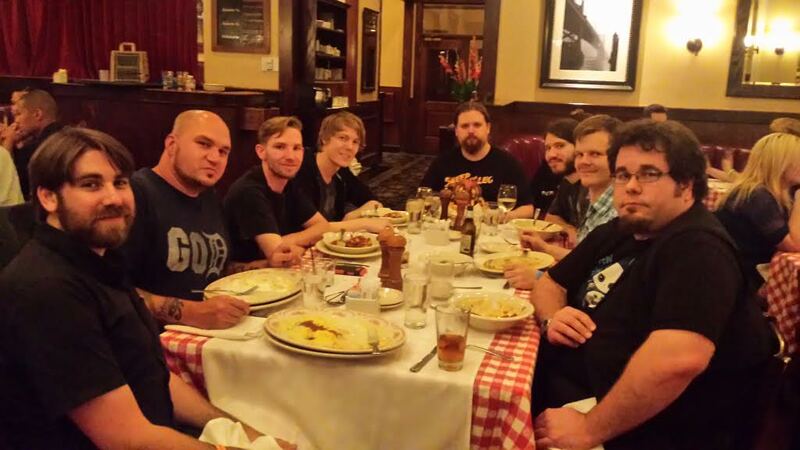 On Sunday evening, with all the tournaments and interviews behind us, with my Bottle back in my possession, we had a celebratory aftermath dinner. This might have been the best part of the weekend. For now, my friends, it is time to part ways once more. In the process of assembling this entry, I have been diligently working on the next one. Hopefully it will not be so long in between this time, but sometimes life has a way of keeping me from pecking away at the keys. But have no fear, I will be back. My bottle may be old and covered in Dust, but the Djinn is still scheming inside. Posted on September 10, 2015 September 20, 2015 by Librarian of Leng	Bookmark the permalink.